WORCESTER - Wacky, crazy or insane. Whatever adjective you choose, any would apply to Tuesday’s Pope Francis at St. Peter-Marian baseball game. In a contest which had it all, from gritty pitching to timely hitting to a large number of miscues, and a plethora of base runners left stranded, the Cardinals ultimately found a way to prevail. as they scored two runs in the top of the eighth and held on for a 5-4 victory. After tying this tilt 3-3 in the top of the seventh inning, courtesy of a two-out Guardian error, the Cardinals grabbed their first lead one frame later. It all began with two out, and pinch-runner Connor Koziol standing on second base. Troy Donohue was intentionally walked and Liam Sears followed with a line single into right, scoring Koziol with the go-ahead run. Moments later, Kevin Murphy lifted a single in front of left fielder Kevin O’Callahan that plated Donohue and push Pope Francis out in front 5-3. To their credit, the Guardians (4-4) managed to stage a rally in the bottom of the inning. With one out, Jeff Lamothe reached on an error, one of five committed on the afternoon by the Cardinals. After Lamothe advanced to second on a wild pitch, pinch-hitter Frankie Hernandez singled into right, putting runners on the corners. PJ Barry, who finished with three hits, lofted a SAC fly to center that sent home Lamothe and moved SPM to within a run of squaring things up. But SPM felt short in its quest as Donohue, who pitched admirably throughout, finished this one off by striking out Dan Malm. "We had our chances but credit their pitcher because he really gutted it out for them and pitched well," SPM head coach Ed Riley said. "His pitches were all good, but especially his change-up. He started using it more late in the game and it worked. I give Pope Francis a lot of credit for the way they came back. For us, I still like our chances of doing some big things as we move forward. I think we will be OK."
Donohue, a tall, lanky left-hander finished having issued seven hits while striking out out six. "Troy has been outstanding for us all year," said Moriarty. "He has been that way all year. For a sophomore to come into a place like St. Peter-Marian, against a very well-coached team, and to gut it out for eight innings was just phenomenal. He does not surprise me with anything he does. He's that impressive." After surrendering a pair of runs in second inning, the sophomore (now 4-0 on the season) began to settle down quite nicely after that. He would give up a pair of solo runs in the fifth and eighth frames, respectively. But all in all, Donohue managed to strand 10 SPM runners, including leaving the bases loaded in the fourth and seventh innings, without letting up a run. SPM jumped ahead 2-0 in the second behind a pair of Cardinals errors, a Donohue balk and RBIs from Kevin O’Callahan and Lamothe. Pope Francis (7-2) got a run back versus Guardians starter Dylan Fenuccio in the third on a RBI single from Joe Salvon. 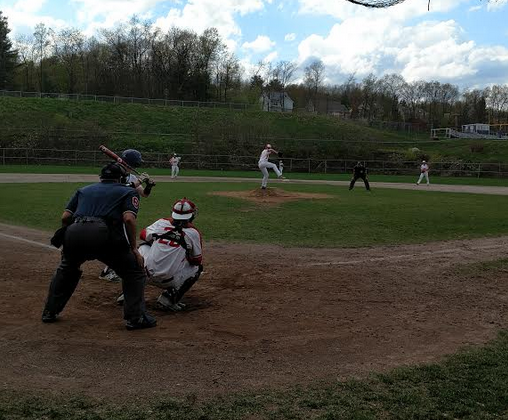 Through his five innings of work, Fenuccio, a senior, avoided danger on a couple of occasions as he allowed just the one run on five hits and stranding six. The Cardinals, for the game, left 12 on base. SPM had a golden opportunity to open this one up in its half of fifth by loading the bases with none out. A fielder’s choice _ force out at the plate was soon followed up by a Donohue wild pitch that plated the Guardians’ third run. However, Donohue shrugged it off and kept it a two run game after retiring the next two batters. In the following frame, with Matt Dumphey now on the mound for SPM, it was Pope Francis’ turn to fill the bases with none out. That was proceeded by a walk to Brian Campbell which made it a one run contest. But Dumphy, a junior, held his ground as the righty set down the next three batters, including a force out at the plate, to keep the Guardians on top. After SPM went down in order quickly in the bottom of the sixth, Pope Francis put forth another threat in the seventh. Salvon reached on a two-out walk. Nick Garde, now inserted as a pinch-runner, stole second. Leahy followed by smashing a hard grounder to shortstop that skidded past Kosta Drosidis and allow Garde to race home with the tying tally. Much-like the Cardinals, the Guardians also had their share of fielding miscues as they committed a total of four. As the inning continued, Leahy would eventually work his way over to third but would go no further as Dumphey induced Kris Alvarado to bounce out. In the deciding eighth, it was clear as to which team was now in control of momentum. Coming up big at the plate with some timely hits, and scoring a pair of runs in the process, would prove to be just enough for the Cardinals to barely come away with a key triumph. "We are just a group full of winners here that play with a lot of passion and it just rubs off on everybody," said Murphy, who will play at Eastern Connecticut State University next season. "The bats weren't really going for us today but we just continue grind things out. That's who we are. Troy pitched really well for us today. He has been a stud for us on the mound. He is a kid that is built for the moment and it showed today. He knows how to win and he knows how to pitch and he's only going to get better."